Poland - K. David Poorman, 80 of Poland died Friday morning March 22, 2019 at the Greenbriar in Boardman. David was born August 23, 1938 in Youngstown, a son of John and Grace Lute Poorman and had been a lifelong area resident. He was a graduate of South High School and had worked as a pipe fitter retiring from Delphi. He was a member of Poland Presbyterian Church. 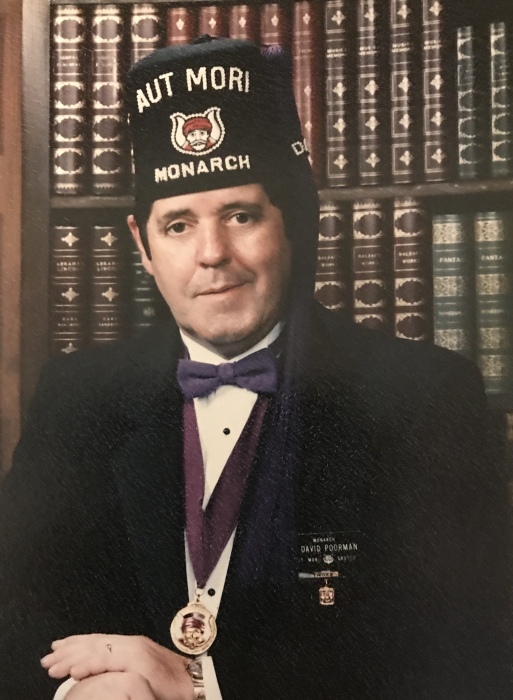 A Mason, he was a member and past Master of the Sulgrave Lodge, now Western Star F & AM and a 32nd degree Mason of the Valley of Youngstown Scottish Rite and a member and past Monarch of the Aut Mori Grotto. He worked many years doing the set-up and take-down for the Aut Mori Grotto Circus in Struthers doing the high rigging, and assisting the children with special needs. Besides his wife, the former Kathleen Kutchel, whom he married April 7, 1979, he leaves his daughter, Jill (Dan) Potkanowicz of Poland; his brother, Earl Poorman of North Olmstead; two sisters, Ruthie Garvin of Philadelphia, Pa. and Jean Woods in Florida; two grandchildren, Thomas (Allyssa) Potkanowicz of Cleveland and Rebeccah Potkanowicz of Poland; a great-grandson, Oliver Potkanowicz; several nieces and nephews and many friends. Besides his parents,he was preceded in death by two sisters, Margaret Oberg and Donna Walters. Services will be held at 11:00 am Monday March 25, 2019 at the Cunningham-Becker Funeral Home in Poland with Dr. Paul Anderson officiating. Friends may call from 2-5:00 p.m. Sunday at the funeral home where a Masonic service will take place at 4:30. Interment will be at Poland Riverside Cemetery. David's family would like to express their very sincere appreciation to the staff at the Greenbriar for the excellent care provided.